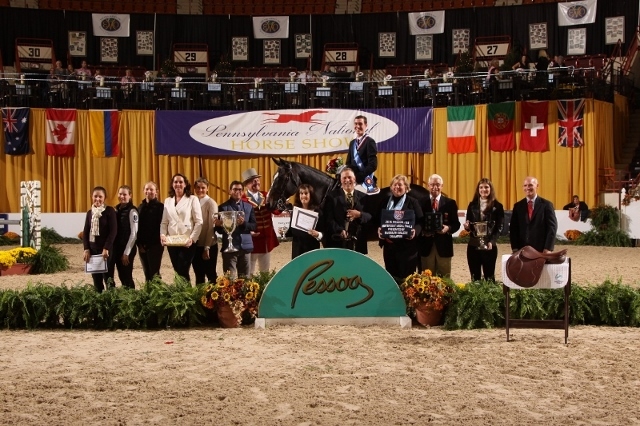 T.J. O'Mara was in disbelief after taking top honors in the Pessoa/US Hunter Seat Medal Final, presented by Randolph College, at the at the Pennsylvania National Horse Show, presented by The Lindsay Maxwell Charitable Fund. The 17-year-old Rumson, NJ, resident moved up from fifth to first to win the coveted title. "I just can't believe it. Two years ago I got my first ribbon here and it meant the world to me," said O'Mara. "I am in shock right now. I never expected this to happen. My goal was just to be in the test, I would have been happy with a top four ribbon. I just can't believe it right now." Annabel Revers of Weston, MA, jumped from 13th place after the first round to the runner-up spot and McKayla Langmeier, East Granby, CT, was third. Following a preliminary round of 276 riders, the top 25 were called back for the second round, which was whittled down to an additional test for the top four. Revers placed fourth, Taylor St. Jacques was called back third, O'Mara was second and McKayla Langmeier of East Granby, CT, was the rider to beat. The final test required riders to complete a course of six jumps including a roll back from the second fence, counter canters at the third and fourth fences and a hand gallop to the final fence. The counter canters proved to be the deciding factor. Riding in reverse order of merit, Revers was the pathfinder and chose to do a simple change for the counter canter. "I was hoping to land both leads on the counter canter, but that didn't work out for the first one so I had to do a simple change, which was fine," said Revers. "This was a really exciting day for me because coming here I was definitely not expecting to be second. I've never even gotten a ribbon at a major equitation final. Today was really my day." O'Mara turned in two flawless flying changes on Kaskade. 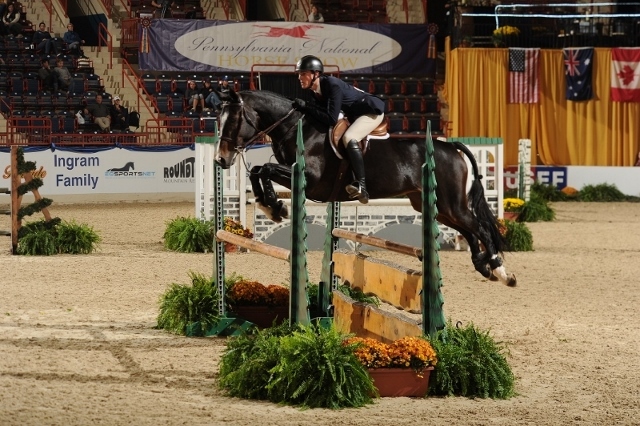 "My mare is just incredible at doing flying changes," said O'Mara. "I was expecting her to land right at the first counter canter but when that didn't happen I had to switch gears and do the changes, focus on the next part of the test and completing the test." Langmeier ran into a bit of trouble with her second change, which according to Judges Jimmy Torano and Marylisa Leffler, cost her the championship. "McKayla came in on top and even when she did the first simple change, she played it safe, which was a smart thing to do because she was winning the class," said Torano. "Then for one second she maybe let up and it cost her, but she still rode great." Sophie Simpson of Jupiter, FL, also had a bit of bad luck. She was called back on top for the second round but had a refusal at a narrow gate, which left her out of contention. O'Mara is trained by Stacia Madden and Max Amaya and will have his name added to the Adrian Van Sinderen Memorial PerpetualTrophy, not far from his sister Meg, who won the Medal Final in 2012. 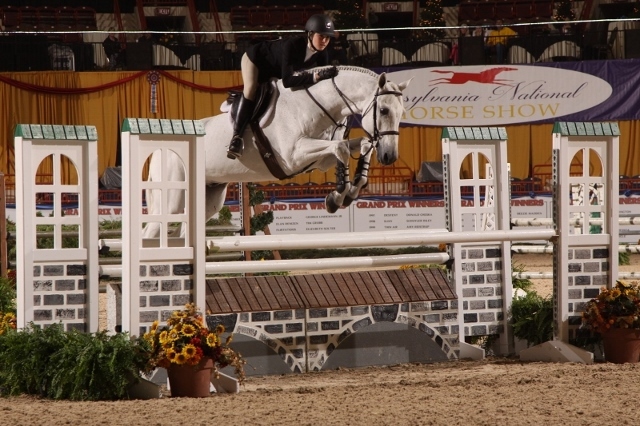 One additional award was given out on Sunday, Charisma, owned by Heritage Farms, LLC and ridden by St. Jacques, won the Doris H. Clark Memorial Perpetual Trophy as Best Equitation Horse.